In late 1931 National Defence Headquarters (NDHQ) decided that a total revision of Dress Regulations (DR) was required. A minor update had been published in 1924, primarily to address changes in Service Dress and the sequence of wear for the many Orders and decorations bestowed on Canadians during the First World War. The previous exhaustive compilation of dress instructions had been promulgated 25 years earlier, in 1907. It was woefully out of date. The process to revise the 1932 DR started with identification of the basic, common-to-all, dress instructions for every item of wear from boots to gloves, tunics, badges, to head dress, etc. Then each regiment and Corps was polled to confirm or amend the compiled information. Needless to say, this involved an incredible volume of correspondence, compounded by the use of District headquarters as intermediaries. The Districts’ role was to merely transcribe the questions and forward these to the units under their control and when the replies were received, transcribe these and forward the same to Militia Headquarters in Ottawa. The Argyll Light Infantry was directed in June of 1932 to confirm that they wore the traditional undress forage cap of a Light Infantry regiment, i.e., green cloth with green welts. Several weeks later the reply received stated unequivocally that “The Officers of the Argyll Light Infantry have not, in the past, worn the green cloth Undress Forage Cap authorized for Light Infantry Regiments: nor do they desire to adopt this pattern of headdress”. Based on this reply Militia HQ assumed that the ALI wore the standard blue cloth cap with band of maple leaf lace and a red welt on the crown. 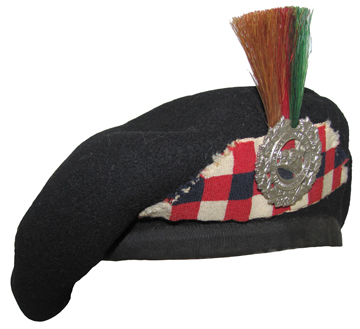 An example of the Argyll Light Infantry cap with diced band and red welt on the crown. This cap, which dates from approximately 1920, was not authorized. Although the ALI had declined to wear the green Light Infantry cap they were authorized to wear this blue cap with a maple leaf band. 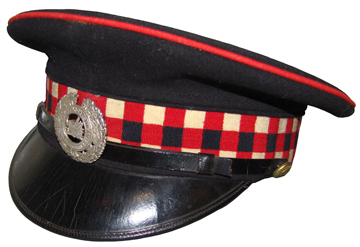 At this point NDHQ undertook some research and discovered that the Argylls had worn a diced band as early as the 1870s when ‘Argyll’ was added to the regimental name, although no formal authority had ever been published in General Orders, It was obvious that Militia Headquarters had dropped the ball in 1932 by not following up. After the Light Infantry cap had been dismissed out of hand, NDHQ should have determined exactly what cap they wore. Lieutenant L.F.Green wearing the diced band on his Service Dress cap. Permission for variance this was not forthcoming and the ALI was advised to cease this practice. The photo is that much more interesting as Lt Green wears the cap badge of the 2nd Battalion, CEF, which was raised in large part by the ALI, now perpetuated by the Hastings and Prince Edward Regiment. Photo courtesy the Hastings and Prince Edward Regiment museum. The sole face-saving solution to this conundrum was to obtain retroactive permission and ‘bless’ the diced band for the Undress Forage Cap. Finally, in January 1934, the Secretary of the Department of National Defence approved a blue cap, with red, white and dark blue diced band, and a ‘scarlet welt on the crown only’. Of note, the diced band now included dark blue instead of the original black. Insofar as having diced bands on the khaki Service Dress cap, NDHQ was firm in its stance that no variation would be permitted and the diced band could no longer be worn. When the Argyll Light Infantry was converted to a ‘Tank’ battalion in 1937 they were advised, in April of that year, that tank battalions were now authorized to wear the ‘Black beret of the pattern worn by the Royal Tank Corps’. 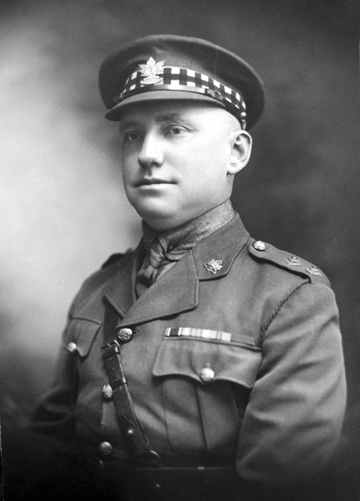 Ironically, the adoption of the beret for all orders of Dress meant that the long-fought battle for a diced band on the forage cap became moot, as that type of headdress would no longer be worn by the Argylls. Permission to wear the black beret had been extended to several regiments and the new armoured fighting vehicle training school. Affected regiments were also advised that the black beret would be worn in both Full Dress and Undress, ‘with a distinctive flash’ and the regiments were to submit a pattern of flash for NDHQ approval. In the terminology of the day, a ‘flash’ would consist of an embellishment such as a plume, similar to that worn by the Royal Tank Corps. Not willing to admit defeat the ALI identified their ‘flash’ as a ‘diced band… in the form of a plaque, running horizontally under the badge.” This caused confusion at NDHQ and they were quick to ask for clarification by requesting ‘….that further details of the proposed plaque may be submitted, viz, the dimensions, the metal of which it is to be made, the method of attachment to the beret and the manner in which the colours of the diced band will be shown thereon.’ NDHQ went on to suggest that the ALI submit their reasons for recommending a plaque, instead of a patch. The sample patch for use on the black beret, sent to National Defence Headquarters. This example is attached to the original correspondence held by the Library & Archives Canada (LAC). The Officer Commanding the ALI replied stating that ‘it was not his intention to have the diced band placed on a metal plaque, but worn in the form of a patch.’ Demonstrating they had not given much thought to their proposed dicing, the ALI requested a sample beret from NDHQ in order to try out ‘different patches’ to determine the proper size. In October, Major-General Caldwell, the Master-General of the Ordnance, intervened and noted that ‘a beret with a regimental coloured band has recently been authorized for the (British) 11th Hussars … and a sample of this beret is being obtained.’ Five months later, in April 1938, a brown beret of the 11th Hussars as well as a black beret as worn by officers of the Royal Tank Corps were forwarded to the ALI for their consideration. At the end of May the Argylls forwarded a drawing of the patch they wished to adopt. The drawing included their proposed patch, and additionally, a flash in the style of that worn by the Royal Tank Corps. Rather than provide clarity, further confusion was created at Headquarters. They formed the impression that the ALI now wished a patch in lieu of a flash and sought clarification. They asked if the ALI ‘wishes to have a flash as well as a patch’ and, if a patch was desired to advise the colours ‘which should not be the same as worn by the Royal Tank Corps’ (brown, red and green1). 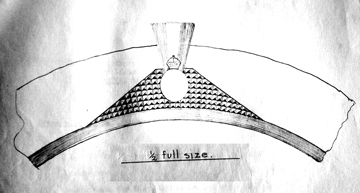 The drawing also raised questions about the dicing which was eight squares wide while NDHQ preferred that the ALI use dicing limited to three squares wide, in keeping with the pattern approved for the Undress Forage cap. While waiting for confirmation from the ALI, (their Commanding Officer was absent due to illness), information was received in Ottawa that the (British) Army Council had approved the use of the RTC colours by Canadian Tank battalions. This new information was conveyed to the ALI in October 1938. A fine example of the finished product. With the advent of the Second World War there was little opportunity to wear the beret with both the patch and the flash. Beret courtesy the Hastings and Prince Edward Regiment museum. 1. First used at the battle of Cambrai when a flag with these colours was unfurled, representing ‘Through the mud, and the blood, to the green fields beyond. 2. It would be December 1940 before the existing cap badge die was sent to the Lackie Manufacturing Company to be altered, at a cost of $12.00, to include the ‘Tank’ and 1941 before new badges were made. When the Dress Regulations were finally published in 1932 the entire section dealing with the Infantry was omitted. This was mostly due to the difficulties in obtaining accurate details from a number of regiments. Curiously, the Cavalry, including Hussars, are well described. After many years of research the author has located the unpublished drafts of the Infantry Corps. Publication of this section was delayed by the Second World War and was mostly out of date by the end of the war. The author wishes to thank Bill Alexander for his editorial review. Sacrilege! The Essex Regiment (Tank) was the first to wear the coveted Black Beret! When the new tank regiments were formed, Army headquarters ordered that the unit wear their traditional headdress. The ER(T), having no traditional headdress purchased black berets locally and issued them to the troops.